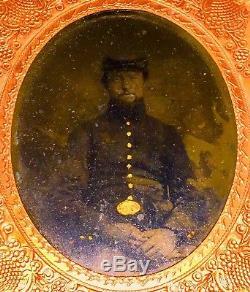 Original 1/6 plate tintype of an unidentified Union soldier, with gold tinted buttons & buckle. Tintype is housed in glass with matte & frame. Tintype is in good condition, image displays slightly on the dark side, but its a nice image! 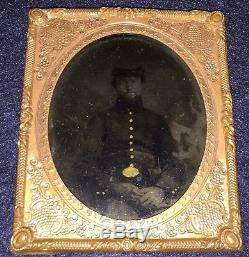 The item "1/6 Plate Tintype Union Civil War Soldier In Glass, Matte & Frame" is in sale since Monday, October 8, 2018. This item is in the category "Collectibles\Militaria\Civil War (1861-65)\Original Period Items\Photographs". The seller is "ktkillion" and is located in Saint Charles, Illinois. This item can be shipped to United States, Canada, United Kingdom, Denmark, Romania, Slovakia, Bulgaria, Czech republic, Finland, Hungary, Latvia, Lithuania, Malta, Estonia, Australia, Greece, Portugal, Cyprus, Slovenia, Japan, China, Sweden, South Korea, Indonesia, Taiwan, Thailand, Belgium, France, Hong Kong, Ireland, Netherlands, Poland, Spain, Italy, Germany, Austria, Israel, Mexico, New Zealand, Singapore, Switzerland, Norway, Saudi arabia, United arab emirates, Qatar, Kuwait, Bahrain, Croatia, Malaysia, Chile, Colombia, Costa rica, Dominican republic, Panama, Trinidad and tobago, Guatemala, El salvador, Honduras, Jamaica.